Two University of Wyoming doctoral students see the August 2017 solar eclipse as a prime opportunity for community outreach, combining weather balloons with student participation to provide a closer look at this once-in-a-lifetime phenomenon. Katie Foster and Phil Bergmaier, both UW doctoral students in atmospheric science, are working in concert with the Wyoming NASA Space Grant Consortium on a project that will use weather balloons to track and video record the eclipse, which will cross Wyoming Aug. 21 next year. For the project, the Wyoming NASA Space Grant Consortium will send a weather balloon and its payload -- live-broadcasting cameras, video and tracking systems on board -- up between 60,000 and 100,000 feet in the vicinity of Casper at the time of the full solar eclipse, Foster says. UW is partnering with Megan Graham, a robotics teacher at Casper College, to perform some upgrades to the existing system and, perhaps, some experiments with house-made electronics, Foster says. Shawna McBride, in UW’s Department of Physics and Astronomy and associate director of UW’s NASA Space Grant Consortium, says there are 52 NASA space consortiums nationwide (in all 50 states as well as the District of Columbia and Puerto Rico) that focus on space-oriented educational programs. 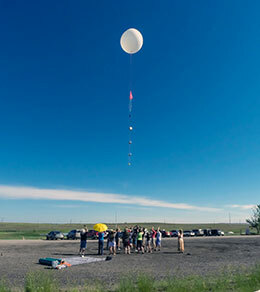 The idea for the weather balloon project was borne out of discussions that took place at the group’s two national conferences held each year. McBride says the launch will take place in the morning before Wyoming’s notorious winds pick up. The biggest concern will be jet streams that could potentially blow the weather balloon off course. “Phil and Katie are getting online flight predictions this month to see what conditions might be like next August,” McBride explains. In addition to the Casper launch, Suki Smaglik, a former professor of earth and physical sciences at Central Wyoming College, will head a group of middle school and high school teachers, and their students, from Riverton who will launch a balloon near Pavillion. Another group, headed by Jack Crabtree, an adjunct professor from Embry-Riddle Aeronautical University in Arizona, will launch a weather balloon from Glendo State Park in Platte County. Dozens of groups from across the United States -- ranging from Oregon to South Carolina -- will launch high-altitude balloons over the path of eclipse totality, capturing live video from onboard cameras at 60,000-plus feet as the shadow of the moon passes over the Earth below. These videos will be streamed live over the internet to NASA’s website for millions of people to see, Bergmaier says. To see that video, go to https://www.youtube.com/watch?v=W_9eYcGIT88. This NASA-supported collaborative effort started at Montana State University, which is noted for having a strong balloon satellite program, McBride says. For more about this outreach project, go to http://eclipse.montana.edu/.